I hope you all have had a wonderful holiday weekend! 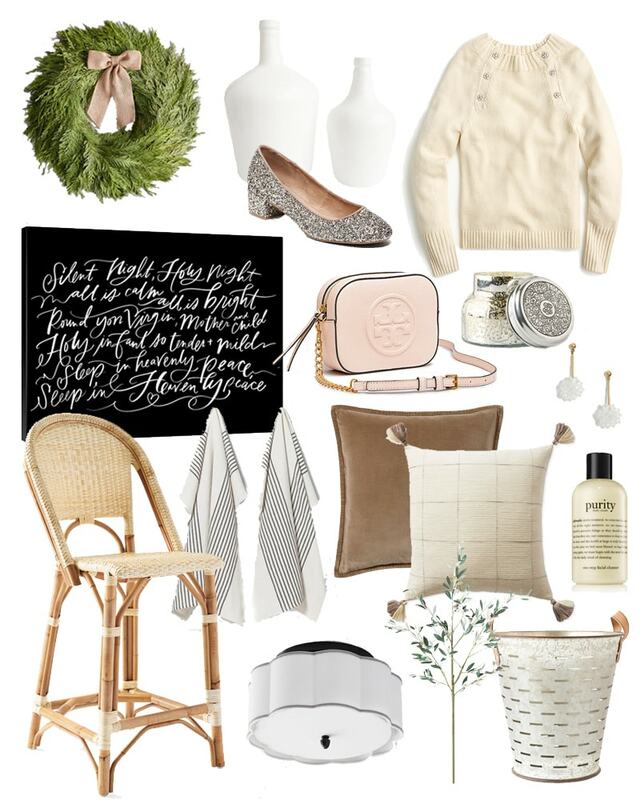 Today I’m sharing all of the best Cyber Monday sales along with my top picks. And, later this afternoon, I’ll be back to share my DIY marble paint ornament tutorial along with our office Christmas tree so I’d love to have you check back then! And, if you’re looking for some gift ideas be sure to check out my holiday gift guides! Side note: we got the chance to try this gift idea out at my parents house this past weekend, and everyone that tried it said it was life-changing! Highly recommended! In the meantime, here are the best Cyber Monday sales – there are so many good ones! AMAZON has tons of Black Friday Deals all week long! Our big purchase of the weekend was these travel pillows a new vacuum. You know you’re an adult when… 😉 We stopped mid-order on the Ring doorbell and now we’re deciding between that and the Nest doorbell. Any feedback on either would be appreciated since we want to order by the end of the day to get the best pricing! You can see and shop all Amazon deals here. ANTHROPOLOGIE is offering 30% off everything! No code required – price updates at checkout. This includes my favorite year-round candle scent – in tons of containers and sizes. Such a great gift idea! You can shop the sale here. ATHLETA is offering 20% off your entire purchase with code BOOST. You can shop their sale here. BALLARD DESIGNS is offering 30% off everything with code CYBER! You can shop their sale here. BAUBLE BAR is offering 35% off sitewide with code CYBER35. They also have some amazing deals (up to 60% off) on their gift sets! You can shop their sale here. CRATE & BARREL is offering 20-40% off sitewide. Prices as marked and there are some exclusions. Their Christmas tree collars are 30% off! Shop the sale here. J CREW is offering 50% off your entire purchase along with an extra 60% off sale styles with code CYBER. Shop the sale here. J CREW FACTORY is offering 60% off sitewide and up to 80% off clearance with code ADD2CART. Shop the full sale here. JOSS & MAIN is offering an additional 25% off their Black Friday and Cyber Monday sales with code EXTRA25. You can shop their sale here. KOHL’S is offering an extra 20% off your purchase with code GIVE20 – along with $10 off every $50 spent with code JACKPOT. You can shop the sale here. KOPARI is offering 20% off sitewide with code STEALS, and some items 40% off. Although I still prefer Native for deodorant, I love all of the other Kopari products! You can shop the sale here. LINDSAY LETTERS is offering 20% off everything with code YAY20. I got the Silent Night canvas this year and I’m obsessed! You can shop the sale here. LOFT is offering 50% off your purchase with code CYBER. You can shop their sale here. MARK & GRAHAM is offering 25% off everything along with free monogramming and shipping with code FRIENDS. You can shop the sale here. MCGEE & CO. is offering 20% off sitewide with code THANKYOU. You can shop the sale here. MINTED is offering 25% off everything plus free shipping with code CM2018. You can shop their sale here. NORDSTROM has up to 60% off tons of items for their Black Friday/Cyber Monday sale. My favorite cashmere sweater is on sale for under $60 in 14 colors/patterns and makes a great gift! You can shop their sale here. NORDSTROM RACK is offering an additional 30% off clearance items. They are also having a flash sale on Dyson with up to 50% off original prices! You can shop the sale here. OLD NAVY is offering 50% off your entire purchase and free cozy socks with code COZY. And if you’re looking for some fun holiday shoes, check out these glitter pumps. They’re surprisingly comfy and super cute – and under $20 right now! You can shop the sale here. ONE KINGS LANE is offering 30% off sitewide. Some exclusions apply and prices are as marked. You can shop the sale here. PHILOSOPHY is offering 40% off your entire purchase plus a free full-sized bonus gift with code cyber2018. I actually stocked up on all of my favorites on Saturday while they offered 30% off and felt that was an amazing deal so today’s discount is killer! You can shop the sale here. PHOTOGRAPHING INTERIORS, the course I highly recommend in this post, is currently 20% off with code BLACKFRIDAY2018! You can shop the course here. POTTERY BARN is offering 25% off your regular-priced order along with free shipping with code CYBER. They also have tons of items marked up to 75% off. This light fixture is a killer deal! Shop the entire sale here. SERENA & LILY is offering 25% off sitewide with code BIGDAY. This is by far the largest sitewide sale I’ve ever seen them offer! I’m loving this pillow in both color options! You can shop the sale here. SUPERGOOP is offering 25% off your purchase plus free shipping with code HOLIDAY. I’m obsessed with this make-up setting spray. You can shop their sale here. TARGET is offering up to 40% off tons of home items, plus save an extra 15% on your entire purchase (online only) at checkout! Get the details here. Shop the sale here. T3 is offering 25% off sitewide with code MONDAY18. You can shop the sale here. TORY BURCH is offering up to 60% off wide code THANKS, plus 30% off $250+. They also launched a darling Cyber Monday exclusive bag. Shop the sale here. WAYFAIR is offering up to 80% off tons of items sitewide. You can shop the sale here. WEST ELM has tons of items marked up to 70% off. Shop the sale here. WILLIAMS SONOMA HOME is offering a buy more, save more sale with 10-25% off your purchase with code SAVENOW. They also have a bunch of items marked up to 70% off. You can shop their sale here. WORLD MARKET is offering a buy more, save more sale with 15-40% off your entire purchase. They’re also still offering 40% off all furniture. You can shop the sale here. Which one did you go with Ring or Nest? Just wondering thinking about a present for my parents this Christmas. thanks! And funny enough, we ordered another Nest thermostat because we love ours on the main level so much! So we know Nest is a good brand too! We just felt for the doorbell the Ring may be a better fit!